When creating a modern room in your home it is important that you think about every detail of your space and how you want it to be used. For example, if you are looking to create a stylish, sleek and modern bedroom, you will need to think about everything from the rug and the bedding to the candle holder and the curtain tie backs. The key to creating a room that is balanced and stylish is to balance the colours and the style. To create a truly modern interior, you may need to add a variety of pieces. Small simple accessories paired with bold, fresh pieces will create a stunning effect. Choosing a large modern rug as a statement piece for your bedroom will give you something to work with. Find a colour, design and texture that you love and build your room from there. 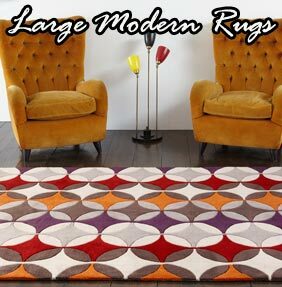 Modern rugs come in a variety of shapes, sizes and textures. Choose something appropriate for your room. For a feminine, contemporary bedroom, a thick pile or shaggy rug will look stunning; or for a more masculine space, a more structured solid pile will accentuate the crisp lines and sharp design of the room. So whatever your taste or style, a large modern rug will suit your home perfectly and paired with beautiful accessories and colours, will make your room stunning.